GREENSBORO, NC--(Marketwired - Apr 10, 2014) - Discover the exceptional shopping, antique shops, galleries and unique boutiques of Greensboro, NC with a well-designed shopping package at one of the premier Greensboro hotels near the downtown district, Friendly Shopping Center and other vibrant attractions. The Greensboro-High Point Marriott Airport hotel has announced its "Shopping Spree" package so families and friends can plan now for remarkable weekend shopping adventures throughout the year. Whether looking for fresh new spring apparel, home furnishings, summer sales, vintage clothing, stylish accessories or back-to-school savings, there's no better place than in Greensboro. And, with added package amenities that include free shuttle service to the nearby Friendly Shopping Center and complimentary breakfast for two at the Marriott's Brush Creek Grille, there's no better place to relax after a long day of shopping than in the neatly appointed hotel rooms found at this prominent lodging in Greensboro. Valid through Jan. 5, 2015 for Thursday through Sunday stays, now is the time to plan and book a weekend escape with the girls or a family shopping spree before the start of school. With rates starting as low as $119*, whatever the occasion this shopping package is sure to help make it fun and affordable. In addition to being convenient to shopping destinations, the hotel's location near the Greensboro Coliseum Complex makes it ideal for attending sporting events, concerts, University of North Carolina activities, trade shows, family events and more so it's easy to plan something everyone in the family will enjoy. Located just a half-mile from Piedmont Triad International Airport, the Winston-Salem area hotel's attentive service includes complimentary shuttle service to the airport and other local destinations upon request. 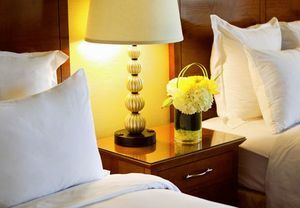 Booking the Shopping Spree package in Greensboro can easily be done online by using promotional code SHO at http://www.marriott.com/hotels/travel/gsonc-greensboro-high-point-marriott-airport/ or by calling 1-800-834-6704 and referencing the code. *Rates are per room per night based on availability at the time of reservation. Valid for Thursday-Sunday stays through 1/05/15, this offer may not be combined with any other discount or promotion. Please visit hotel website for additional terms and conditions. With clean lines, a neutral color scheme and the lofty sort of spaces that feel at once soaring and cozy, the Greensboro-High Point Marriott Airport exudes an inviting contemporary aesthetic in keeping with the modern travelers who come to stay. Located just a free shuttle ride away from the airport, the hotel is also near downtown Greensboro, High Point and Winston-Salem. Whether traveling for business or leisure guests are pampered with down comforters and Plug-In Panels in their guest rooms, an on-site fitness center, indoor-outdoor pool and volleyball courts. The Brush Creek Lounge & Grille serves seasonal, regionally-inspired dishes all day long to accommodate the schedules of busy travelers. Shop till you drop at Greensboro-High Point Marriott Airport Hotel, conveniently located near Greensboro, NC’s Friendly Shopping Center.